Welcome! Today we are celebrating the October stamp release with a Blog Hop brought to you by the Technique Junkies Design Team. The hop starts here, so you are in the right place! This month, we have 12 brand new stamps, including some wonderful additions to the Palettini Line. Follow along the hop to see the new images at their best, then go shop -- the October New Release stamps are 15% off until Friday, October 9th. Your discount will show up at checkout. 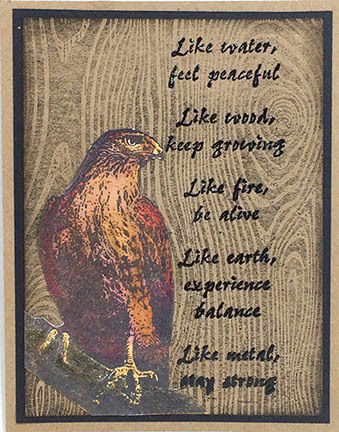 My first card uses the Hawk Background, layered over the Wood Background. 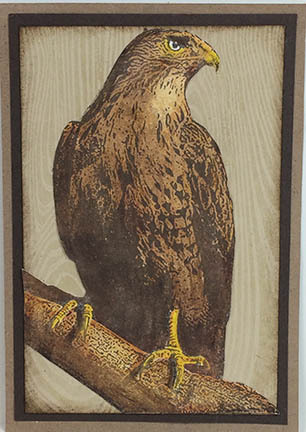 I colored the hawk with Inktense Pencils, since they are so great for layering color. 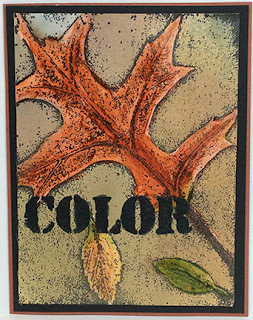 This uses the Oak Relief background stamp, colored with Art Anthology Sorbet Paints, with the background sprayed over with several Art Anthology Colorations Sprays.The word was stenciled on using the Art Anthology Soliloquy Stencil using Black Lava Stone Effects (it has a sand texture). Go on over to Pam's Blog for your next stop. I hope you enjoy the hop -- and the new stamps!